The earliest spring flowers will soon emerge. In my garden I’ll admire the delicate white petals of Bloodroot, the first to bloom. Soon I’ll enjoy the blue bell-like flowers of Jacob’s Ladder, the bright yellow of Golden Ragwort, and striking red blooms of Wild Columbine. The flowers are charming, but I will be more captivated by their insect visitors. Small bees and flies will fly from blossom to blossom. Working intently, they will stop briefly to feed and gather nectar and pollen. These will be the first pollinators of the year. As spring and summer progress, pollinators will visit the succession of blooms on my native trees, shrubs, and perennials. Bees, butterflies, flies, beetles, and wasps will be at work. I’ll watch each butterfly unfurl its straw-like proboscis to daintily probe flower heads and sip nectar. Yellow pollen grains will dot the heads and bodies of bees and flies. Female bees will sport saddlebag-like pollen baskets on their hind legs. The undersides of leafcutter bees’ abdomens will be golden from pollen grains stored on special hairs. Bumble Bee with pollen baskets. Photo by Beatriz Moisset. Wikimedia Creative Commons. I’ll notice the size, shape, and tongue lengths of pollinators – characteristics that enable some to better exploit different shaped flowers than others. 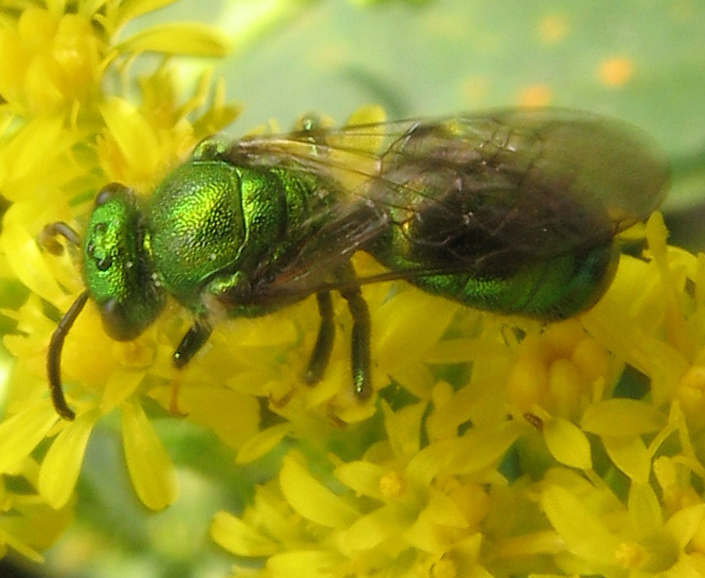 Iridescent green sweat bees will glisten in the sunlight as they feed on nectar. 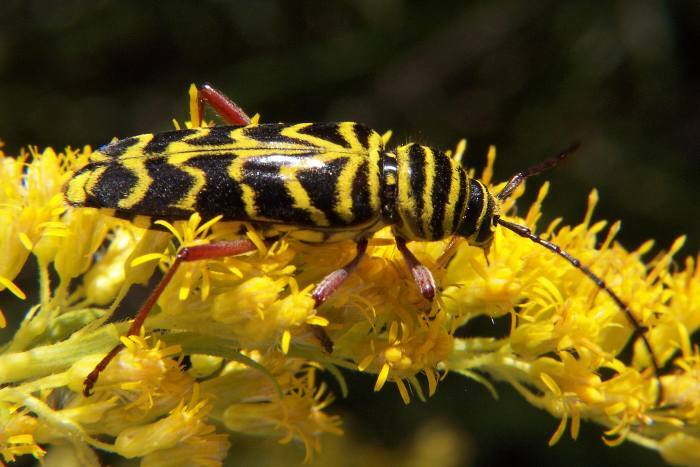 The strikingly-marked Locust Borer Beetle will catch my attention as it methodically forages for pollen on my goldenrods. I’ll marvel at how close I can get to colorful wasps as they busily collect nectar. 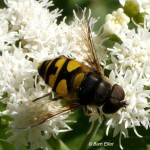 Hover flies will hang suspended in air as they take a break from feeding on nectar and pollen. After dark, with my flashlight, I’ll find moths flying from flower to flower, performing nighttime pollination. 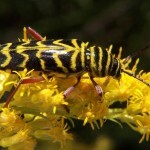 Locust Borer Beetle on goldenrod. Wikimedia Creative Commons photo. My flowering plants put on their royal finery to entice these pollinators, not me. Their showy colors and patterns advertise and guide the pollinators to the plants’ nectar and pollen. The plants must rely on the pollinators to transport pollen among different flowers of the same species. This cross-pollination enables plants to produce the seeds and fruit needed for reproduction. Well-pollinated plants bear more fruit, produce genetically diverse seed, and are healthier. For the pollinators the nectar provides carbohydrates for energy. 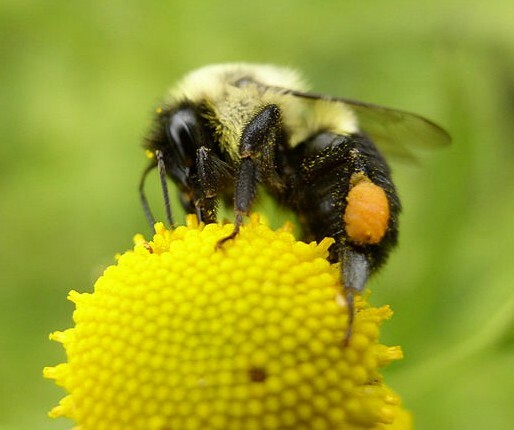 The pollen supplies them and their offspring with protein, vitamins, minerals, fats, and starches. 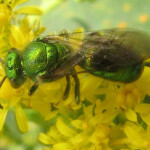 Green Sweat Bee. Photo by Beatriz Moisset on Wikimedia Creative Comoons. the seeds and fruits produced by pollinator-dependent plants. 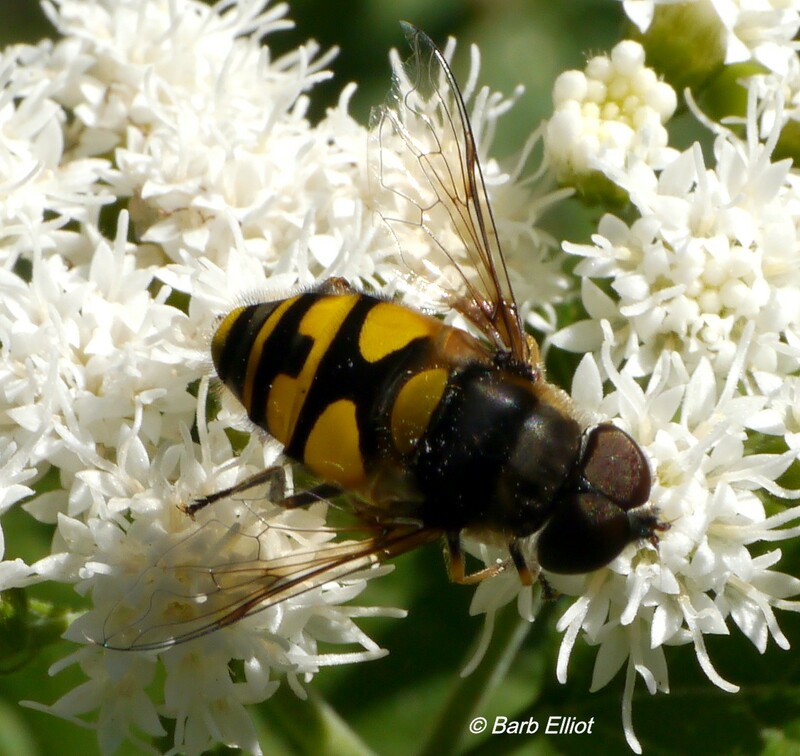 Pollinators themselves are food for birds and other animals, including insects. A diverse population of pollinators is critical to the web of life. Bumble bee with tongue extended on Mountain Mint. Photo @ Barb Elliot. native plants and crops, are also at risk. 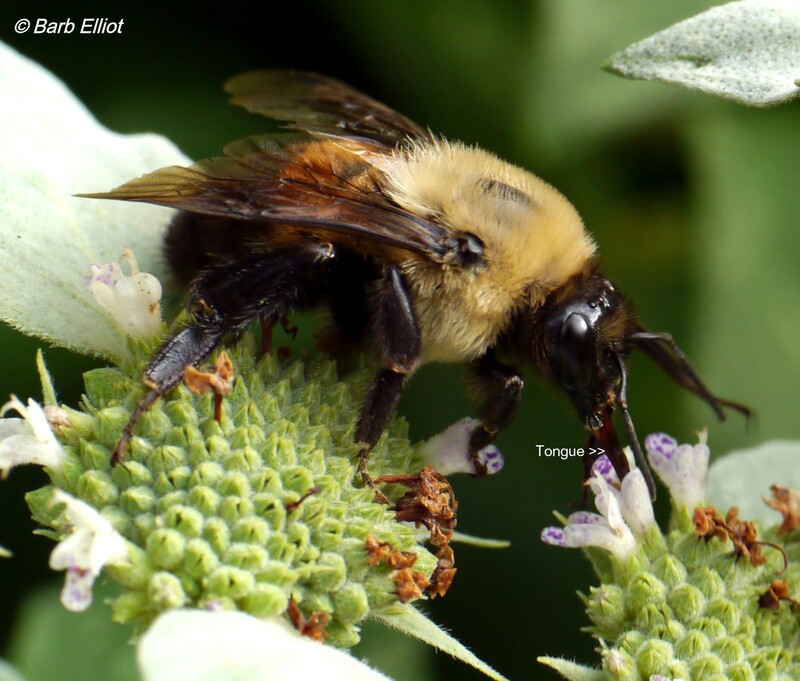 Bumble bees seem particularly hard hit, with about half of our 47 U.S. species in decline. Some are in danger of extinction. Less studied pollinators like beetles, wasps, and moths are likely declining as well. Loss of good foraging and nesting habitat is the primary cause for pollinator declines. Pesticides and introduced parasites add to the toll. Many experts believe neonicotinoid insecticides pose a particular threat to bees and other pollinators. Those that forage on treated plants become weak or die. “Neonics” and other systemic pesticides are taken up through a plant’s roots and travel to all parts of the plant, including its nectar and pollen. Last June, 50,000 bumble bees foraging on flowering trees at a single location in Oregon were killed after the trees were sprayed with a neonicotenoid. Neonics are present in a variety of insecticide brands commonly sold to gardeners. They are also used in nurseries that raise plants. In fact, some plants sold as bee-attractants contain neonicotenoids. Despite all the threats, we gardeners can help sustain pollinator populations in our area. (See table below.) Some gardeners like to attract butterflies, but balk at inviting moths, bees, beetles, flies, and wasps. However, these insects have important roles to play in the web of life and are generally harmless to gardeners. Native bees are unaggressive and rarely sting. 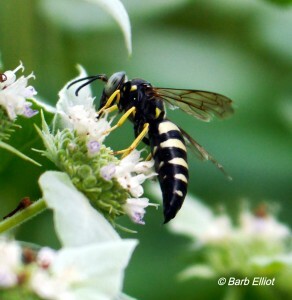 Even wasps are docile when foraging on flowers, although they may forcefully defend a nest. 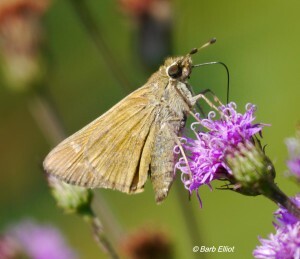 By incorporating a variety of native plants in our yards, our most important conservation action, we will attract pollinators that are also predators and keep insect populations in check. Various beetles, flies, and wasps prey on aphids and other insect pests. By growing a diversity of native plants (see plant list below), we will encourage a healthy balance of insects in our gardens. I hope the plight of the Monarch butterfly will compel us to action. We must help not just the Monarchs* but the less charismatic butterfly, bee, fly, wasp, beetle, and moth pollinators as well. For too long, we have ignored pollinators or treated them as pests to be destroyed. We have gardened for aesthetics and our enjoyment without considering nature. These beneficial creatures are crucial players in the web of life in our own gardens and beyond. We can make a difference for them. We and our gardens will benefit. *Please note that we will be selling milkweed plants for Monarchs again this year! Stay tuned for an upcoming post about Monarchs and details of the milkweed sale. ¨ A variety of nectar- and pollen-rich native plants. Strive for 8 or more species. ¨ Perennials in clusters, preferably 5 or more of a single species, so plants are easily found. ¨ For a succession of blooms from early spring through late fall. ¨ Natives with different flower shapes for pollinators or varied sizes, shapes, and tongue lengths. ¨ Host plants for butterflies and moths. Buy plants at local native plant retailers or where sellers identify whether plants are pre-treated with systemic pesticides such as neonicotinoids. ¨ Areas of bare soil in sunny, well-drained spots. ¨ Stumps, logs on the ground, dead branches and trees. Provide artificial nest sites, e.g., a wooden bee block or a bundle of stems or paper straws. Every 2 years replace or clean with a 3:1 water-bleach solution. Click here for more info. 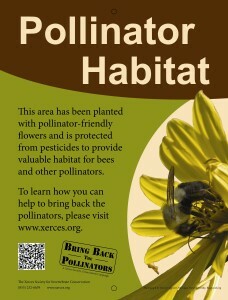 Build a “pollinator condo”. Click here for “how to info” or here for inspirational examples. Don’t use pesticides, but especially avoid neonicotinoids. Click here for a list of common brands containing neonics. This entry was posted in Native Plants and tagged backyard habitat, bee home, beetles, butterflies, gardening, herbicide, insect condo, insect hotel, insects, moth, native bees, native plants, pesticide, pollination, pollinator condo, pollinator friendly, pollinator hotel, pollinators, wasps, wildlife gardening by barb. Bookmark the permalink. Barb, thank you for your thoroughly comprehensive overview of pollinators and our role in supporting them. That pollinators such as monarchs and bees are in serious decline is discouraging, You and Edie will be offering milkweed plants again this year, thank you! It’s so important that we not give up. Thanks, Joan. Yes, it is very important that we not give up on the Monarchs or other pollinators. The smaller the number of Monarchs that return, the more milkweed we need to provide — so they can find it more easily. 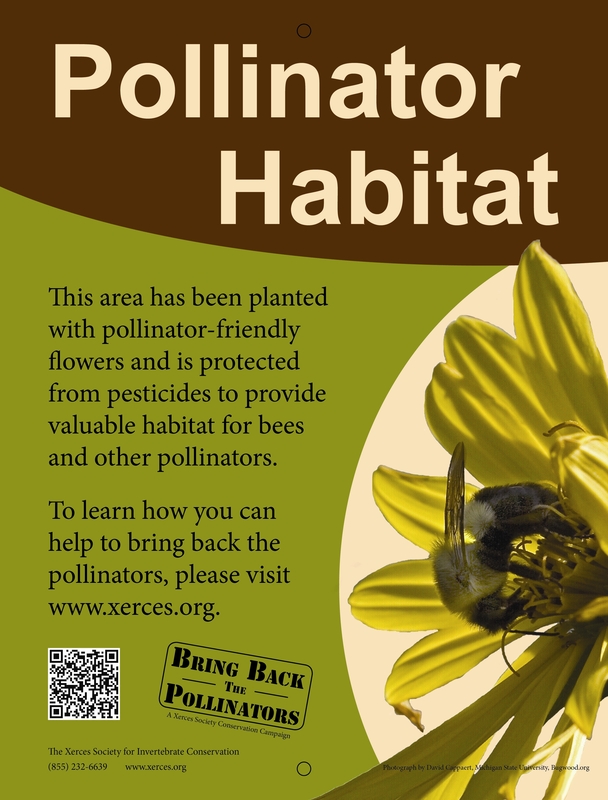 As I know you know very well, planting more native plants is the most important single thing we can do to help sustain bee and other pollinator populations.